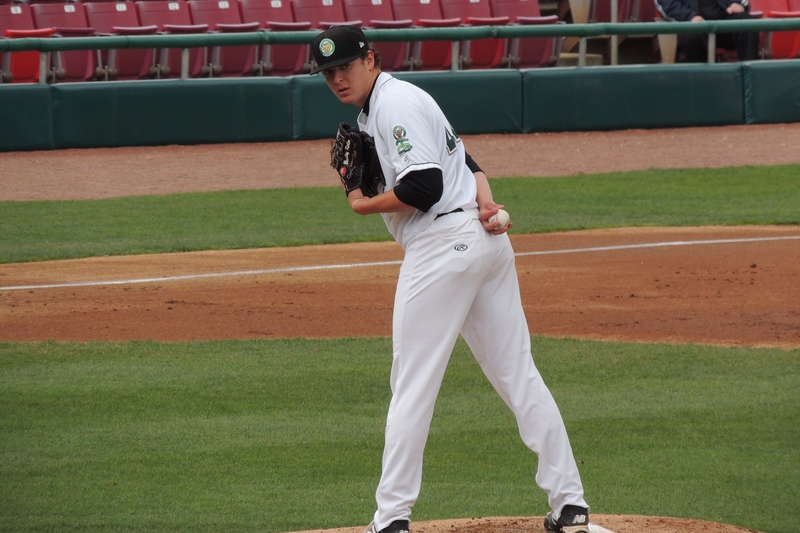 Pat Peterson earned the win for the Clinton LumberKings on Wednesday. Pitching dominated this contest, as batters likely struggled with their timing in the bitter cold. LumberKings SP Pat Peterson improved to 2-1 after holding the Cougars to one run on two hits, two walks and a hit batsman in five innings. He struck out three batters. Cougars SP Brad Keller dropped to 0-2 despite pitching well. He gave up two runs on three hits, two walks and a hit batsman in six innings. He struck out 10 batters. 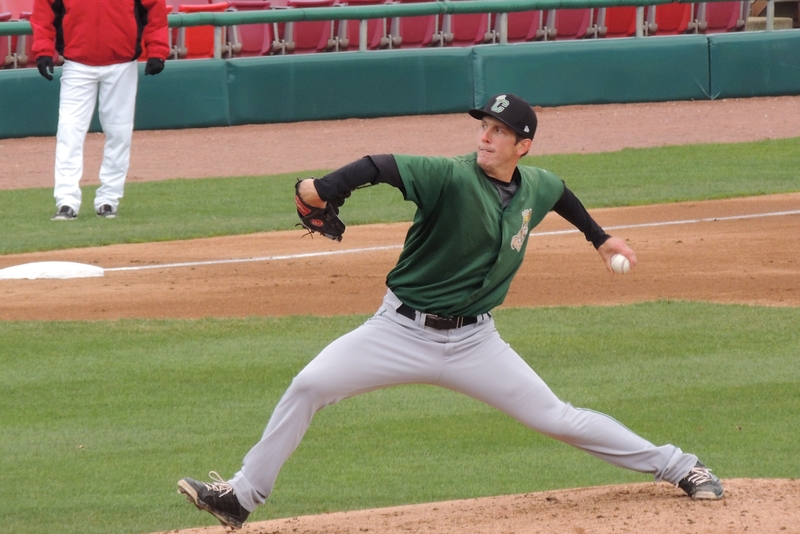 Kane County Cougars SP Brad Keller struck out 10 batters Wednesday. Kristian Brito drove in what turned out to be the winning run on an RBI groundout in the top of the 4th inning. The temperature at game time is listed as 43 degrees in the box score, but it felt like half that. So, as soon as the matinee contest was over, I gladly got in my car and headed for Wisconsin, where, I’m happy to report, it did not snow. Bees SP Keynan Middleton’s winning effort was overshadowed by the offensive output of his teammate Caleb Adams, who had three hits and drove in three runs. All three of Adams’ RBI came on an inside-the-park home run in the top of the 5th inning. His line drive to center field took a high hop over the head of Snappers CF Brett Vertigan and rolled deep toward the wall. An inning earlier, Adams scored Burlington’s first run. 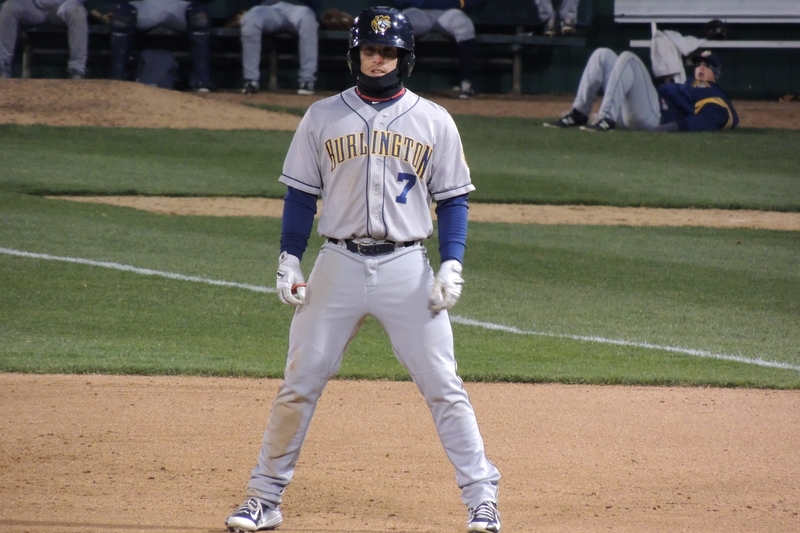 Burlington Bees RF Caleb Adams stands near first base after being hit by a pitch in the 7th inning. Middleton earned his first win of the season after giving up only one run on five hits and two walks in 5.1 innings. He struck out four batters. Argenis Raga had three hits for the Snappers. The River Bandits have a league-best 11-3 record after this road win over the Chiefs. SP Joe Musgrove improved to 3-0 after giving up two runs (one earned) on five hits and one walk while striking out nine batters in 5.2 innings. Jacob Nottingham, Ryan Bottger and Jorge Martinez each homered for the River Bandits. The Hot Rods shut out the Dragons in both ends of their Wednesday doubleheader. Hot Rods RHP Brent Honeywell starred in the first game, coming within four outs of a seven-inning no-hitter. He struck out seven and gave up only one hit and one walk in six innings. RHP Greg Harris won the second game, giving up only four hits (no walks) while striking out five batters in six innings. Eleven players had at least one hit for South Bend as it collected 20 total. Chesny Young and Cael Brockmeyer each had three hits, and Jesse Hodges drove in three runs. South Bend’s stellar performance Wednesday extended to the pitching mound. Cubs SP Jeremy Null improved to 2-0 after giving up only three hits (no walks) while striking out four batters in six innings. All nine TinCaps players collected hits as they amassed 19 total. Duanel Jones had four hits and Felipe Blanco had three. Blanco homered, drove in four runs, and stole a base. Fort Wayne’s Franmil Reyes drove in two runs, as did Lansing’s Richard Urena. Trey Vavra went 4-for-4 and drove in a run for the Kernels. Monte Harrison homered twice for the Timber Rattlers. Julian Leon led the Loons offense with three hits and three RBI. Johan Mieses also had three hits for Great Lakes. This entry was posted in Beloit Snappers, Bowling Green Hot Rods, Burlington Bees, Cedar Rapids Kernels, Clinton LumberKings, Dayton Dragons, Fort Wayne TinCaps, Great Lakes Loons, Kane County Cougars, Lake County Captains, Lansing Lugnuts, Midwest League, Peoria Chiefs, Quad Cities River Bandits, South Bend Silver Hawks, West Michigan Whitecaps, Wisconsin Timber Rattlers. Bookmark the permalink.